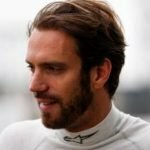 One of just three drivers who switches teams for the second season of Formula E, France’s Jean-Eric Vergne moves from Andretti to DS Virgin Racing this time around. After three pole positions and two podiums in the inaugural season – having missed the first two rounds – Vergne has become a full-time Formula E driver even though he kept his Formula 1 ambitions alive, being a Ferrari reserve driver in 2016. His time in F1 clearly left a mark on the Frenchman, as he is known for being really quick in Formula E, but struggling with the battery management at times. Vergne started car racing with a bang in 2007, winning Formula Campus Renault in his rookie year with six wins in thirteen races. Two years in Formula Renault followed for the Red Bull-backed youngster, with Vergne finishing runner up in both the Eurocup and West European Cup in 2009 – ahead of fellow Formula E racers António Félix da Costa and Nathanaël Berthon. 2010 then saw a step up to the prestigious British Formula 3 series – which he won at the first attempt. A move to Formula Renault 3.5 followed in 2011, where he finished a close runner up to now-DTM racer Robert Wickens. Red Bull showed faith in Vergne in 2012, moving him into the Toro Rosso team for his F1 debut, as both Jaime Alguersuari and Sebastien Buemi were replaced. However, after three years at the team, he himself was replaced at the end of 2014. He then immediately moved into Formula E, taking pole on his debut in Punta del Este. In 2017, he also gave his debut in the FIA World Endurance Championship. He pilots the 600 hp-Oreca-Gibson of the Manor team in the LMP2 class. During his first WEC-outing in Silverstone, he was able to secure a sixth place in his class together with his teammates Jonathan Hirschi and Tor Graves.